Uftring Weston Chevrolet Cadillac presents $10,000 to the Winner of the Peoria, IL Dealership's Grand Opening Promotion. Peorian Tim Pletkovich was presented the check by Owner Mark Weston on November 26, 2012 at the dealership. Uftring Weston Chevrolet Cadillac celebrated their huge four-month Grand Opening Event by offering customers and visitors to their all-new dealership a chance to win $10,000 in Holiday Cash. On November 26, 2012, Owner Mark Weston presented Tim Pletkovich of Peoria a check for the promotion's $10,000 Grand Prize. Mr. Pletkovich is a customer of the dealership and the editor of Civil War Fathers, Sons of the Civil War in WWII. All of the employees of Uftring Weston Chevy Cadillac would like to extend their congratulations to Tim and also thank the many customers and friends who stopped by the dealership to register over the past few months. Uftring Weston Chevrolet Cadillac celebrated the new dealership with a multi-month Grand Opening Event featuring special offers, giveaways and tours of the new facility. The Sales Department is open Monday, Wednesday and Thursday from 8am to 8pm, Tuesday and Friday from 8am to 6pm and Saturday from 8am to 5pm. The Service Department is open weekdays 7am to 6pm and Saturdays 8am to Noon. Uftring Weston Chevrolet Cadillac is a full-service automotive dealership serving customers throughout central Illinois. 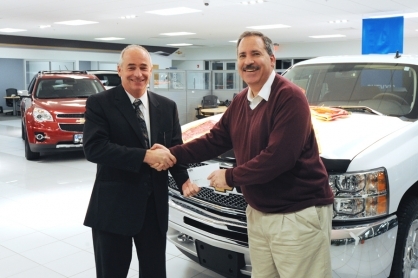 Formerly Jim McComb Chevrolet, Uftring Weston has over 80 employees in sales, service, parts and body shop departments. Uftring Weston Chevrolet Cadillac is an Uftring Auto Group dealership and a multi-year recipient of the General Motors Mark of Excellence Award.